1 First, get a pot and get it nice and hot over medium high heat. Pour some oil and throw in the onion and half of the ginger. Gently add the chicken and sauté for a good 1 minute. Drizzle fish fish sauce over and mix this well. 2 Place the sayote and coconut meat before pouring the coconut water and the remaining ginger. Let this simmer for a minute before adding the Knorr Chicken Cubes. 3 When the Chicken and vegetables are cooked through, top the Tinola with dahon ng sili and simmer for another minute. 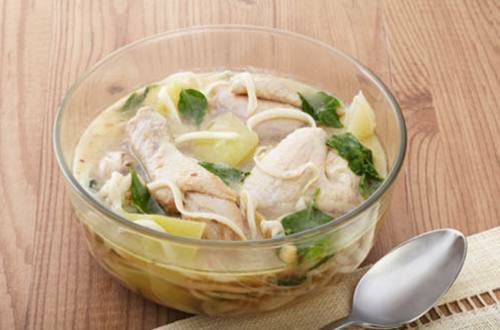 4 This Tinola sa Buko definitely soothes and comforts. Serve this to your family and see their love for you grow immensely.